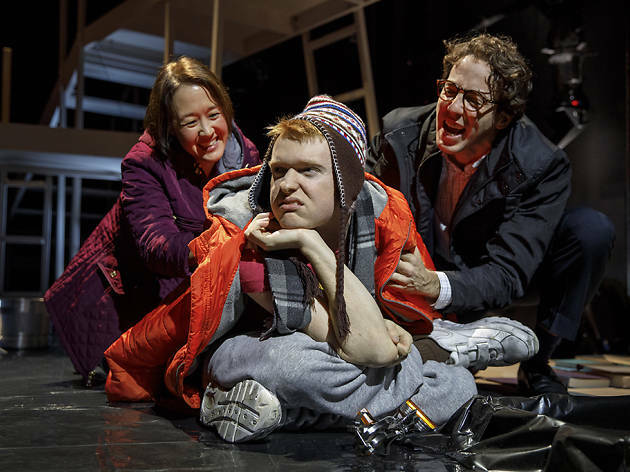 Neurodiversity takes the stage in Uncommon Sense, Tectonic Theater Project’s moving and at times surprisingly funny play about autism. Playwrights Anushka Paris-Carter and Andy Paris offer four nonintersecting but mutually resonant stories. Two are about parenting: Moose (Andrew Duff, in an affecting nonverbal performance) is a severely autistic young adult whose parents must grapple with whether to place him in an assisted-living facility; Lali (Jill Frutkin) is an Indian child whose mother (Purva Bedi) takes her to a speech pathologist. The other two stories focus on high-functioning adults in relationships. The troubled college student Jess (standout Jessica Almasy), who has “involuntary selective photographic memory,” is solicited by a hilariously clueless lacrosse player (Brian Hastert) for tutoring. Dan (Scott Barrow), a self-identified “Aspie” who struggles with social cues, gets set up on a date with an actress (Frutkin). 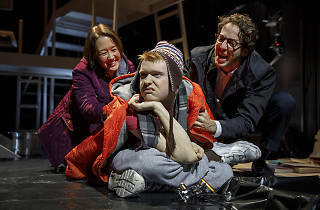 Paris’s direction uses multimedia effects to convey the overwhelming sensory onslaught that several of the characters feel; the run of the show includes special “relaxed performances” to accommodate audience members who are challenged by overstimulation or the strictures of theater etiquette. Some audience members will be granted new insight into an enigmatic condition, while others may be gratified to see themselves or their loved ones represented so three-dimensionally onstage. A compassionate and nuanced work that eschews stereotypes, maudlin arcs and pat resolutions, Uncommon Sense invites us to experience a diverse and vibrant spectrum instead. Sheen Center (Off Broadway). By Anushka Paris-Carter and Andy Paris. Directed by Paris. With ensemble cast. Running time: 1hr 30mins. No intermission. Through Nov 26.